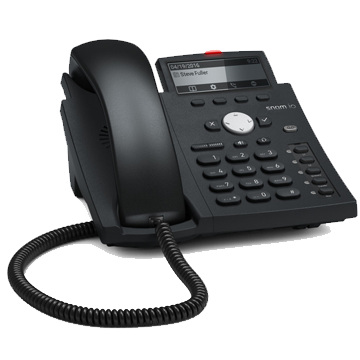 Snom's D315 desk phone supports up to 4 SIP accounts and features a backlit graphical 4 line display. The D315 has 5 programmable function keys with green LEDs and a local directory supporting up to 1000 entries. It also features a high-speed USB port which enables connection of a variety of accessories such as the D3 expansion module or Wi-Fi dongles and a Gigabit Ethernet switch to ensure you get the most out of local connections. Designed to last, the D315 features a dual IPv4 / IPv6 stack, which ensures that it is future proof even as networks evolve. With its flexible design, the D315 is suitable for use in a wide variety of environments, including offices, call centres and reception areas.